Fierce fighting was continuing in eastern Ukraine, less than an hour before a ceasefire was due to come into force at midnight (22:00 GMT). A police chief said the strategic town of Debaltseve was suffering a ferocious bombardment by pro-Russian rebels. Renewed fighting was also reported near the southern port city of Mariupol. Meanwhile, the US ambassador to Ukraine tweeted recent satellite images that he said showed Russian artillery near Debaltseve. Geoffrey Pyatt also said on Twitter that Russian units along the border were preparing a large shipment of supplies to separatist fighters. He said that the rebels were now better armed than some Nato countries. Ukrainian President Petro Poroshenko gave a news briefing as the ceasefire was due to start, giving an order to the armed forces to stop fighting. Mr Poroshenko earlier discussed the ceasefire deal with US President Barack Obama, his office in Kiev said. Rebel leaders in the self-proclaimed Donetsk People's Republic (DNR) and Luhansk People's Republic (LNR) earlier ordered their forces to cease fire from midnight. The LNR said it had started to withdraw heavy weapons from the front lines in accordance with the Minsk deal, Russia's Tass news agency reported. The report could not be verified. Ukraine and the West accuse Russia of sending troops and weapons to help the separatists in Ukraine's Donetsk and Luhansk regions - a claim the Kremlin vehemently denies. Media captionPetro Poroshenko warned the deal to end the war in the east was in "great danger"
"The militants are destroying Debaltseve," Donetsk region police chief Vyacheslav Abroskin was quoted as saying by Ukrainian media. "The shelling of residential areas and civilian buildings continue. The city is on fire. There has been a direct hit from Grads (rockets) on the city police station." In Mariupol, reports said pro-Russian rebels were using artillery and tanks to attack nearby villages. The port city lies between rebel-held eastern areas and the southern Crimea peninsula, which Russia annexed last March. Ukrainian Deputy Defence Minister Petro Mekhed said on Friday the rebels wanted to "raise their flag" over Debaltseve and Mariupol before the ceasefire kicked in. Ukraine's military said on Saturday morning that seven service personnel had been killed and 23 wounded over the past 24 hours. 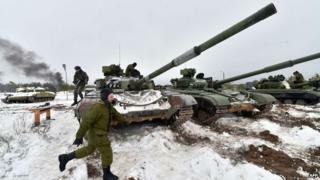 "Ahead of midnight rebels are trying to complete tactically important plans to enlarge the territory under their control," Ukrainian government spokesman Andriy Lysenko said. The BBC's David Stern in Kiev says that as the clock ticks down to the ceasefire, fears are rising that it won't be observed. President Poroshenko warned that the peace deal struck in the Belarusian capital Minsk on Thursday was in "great danger". He accused Russia of "significantly increasing" its offensive. The presidents of France, Russia and Ukraine as well as the German chancellor - who together struck the Minsk agreement - are due to discuss the latest developments by phone before the truce takes effect. President Poroshenko on Saturday already had a conversation with his French counterpart Francois Hollande and German Chancellor Angela Merkel. A previous ceasefire agreement signed in Minsk last September failed to take hold. The UN Security Council will also meet in emergency session on Sunday. In another development, a consignment of armoured vehicles from the UK has been delivered to Ukraine by a private company, the Ministry of Defence confirmed. It said they were out-of-service, unarmed vehicles and were not lethal equipment. Pro-Russian rebels signed the peace agreement but key issues remain to be settled, including the situation in Debaltseve. European leaders have warned Russia that it could face additional sanctions if the agreement is not respected. German Chancellor Angela Merkel said the deal offered "a glimmer of hope", but warned: "It is very important that words are followed by actions." Officials say more than 5,400 people have been killed since the conflict began, but the UN believes the actual death toll to be much higher. Two Minsk accords - what are the differences? Please include a contact number if you wish to be contacted by a BBC journalist.